In this bento: Ham & cheese Pumbaa sandwich, rocket shaped cheese crackers, sliced strawberries, yellow carrot "Hakuna" (attached to the strawberries with toothpicks), yogurt covered star cookies, mini yellow pepper, and blueberries. If you look closely you will notice that the last "A" in "matata" is actually a #4. I had to improvise as I only have two sets of alphabet picks. 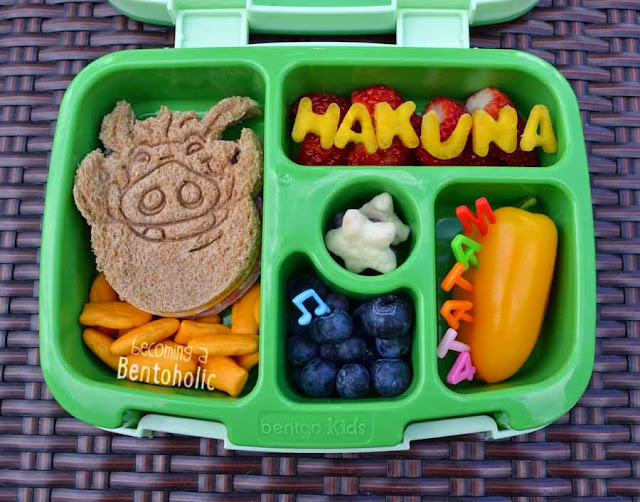 The Pumbaa cookie cutter came with Disney Cakes and Sweets - issue 25.